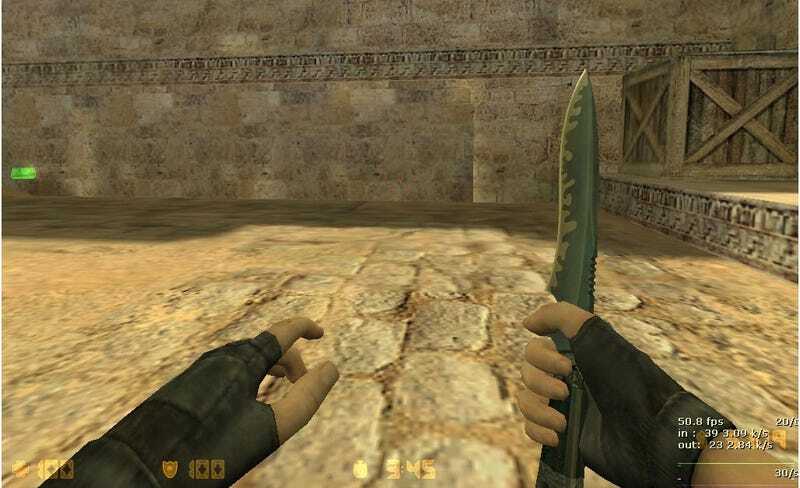 A Counter-Strike player in France has spent six months plotting a revenge attack against a man who beat him in an in-game knife fight. His eventual revenge was not in-game. 20 year-old Julien Barreaux, from Cambrai, had his Counter-Strike character "knifed" in a game late last year against another man, known only as "Mikhael". Enraged at this blight against his talents, Barreaux spent six months tracking him down in the real world. When he eventually found the victim, Barreaux knocked on the guy's front door, then "plunged a kitchen knife into his chest" when Mikhael opened it to greet him. He missed his heart by an inch. A local police officer told the courts "Barreaux was arrested within the hour and told us he had wanted to see his rival wiped out for killing off his character." The judge, who locked him up for two years on a charge of causing grievous bodily harm, says of Barreaux, "You are a menace to society. I am frankly terrified of the disproportionate reaction you could have if someone looked at you the wrong way in the street."